In the 1998 song “This Kiss”, country singer Faith Hill describes the way she feels for the person she loves as “centrifugal motion”. Either Hill wants to get away from the song’s subject ASAP or she mixed up the term centrifugal with centripetal. We’ll forgive the 20-year-old song’s inaccuracies — besides, understanding the effect of centrifugal force is more important when designing components in a wide range of industries, such as centrifugal pumps for automotive applications, than in songwriting. What Is a Centrifugal Pump? If Faith Hill changed her lyrics to mention centripetal motion (left) instead of centrifugal motion (right), the song would make much more sense. Centrifugal pumps, which move fluid by converting rotational energy into hydrodynamic energy, rely on centrifugal motion to operate. These pumps are common in many industries and application areas, such as vacuum cleaners and pumps for water, sewage, and gas. A typical centrifugal pump. Image by Bernard S. Janse — Own work. Licensed under CC BY-SA 3.0, via Wikimedia Commons. Using the Mixer Module, an add-on product to the CFD Module and the COMSOL Multiphysics® software, you can model a centrifugal pump and analyze its operation. 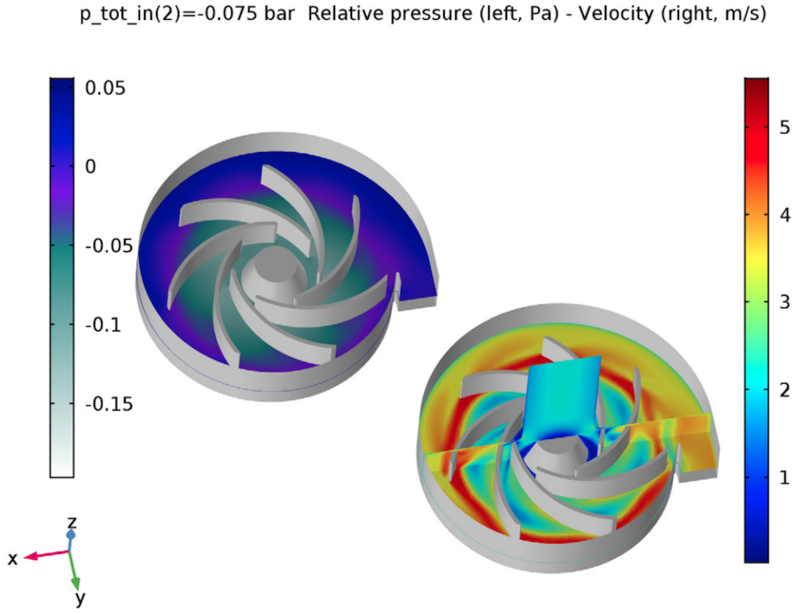 The Centrifugal Pump tutorial model includes a helpful demonstration of how to set up this rotating machinery simulation using the frozen rotor approximation. The centrifugal pump used in this example is a semiopen impeller with seven vanes and a spiral-shaped volute. 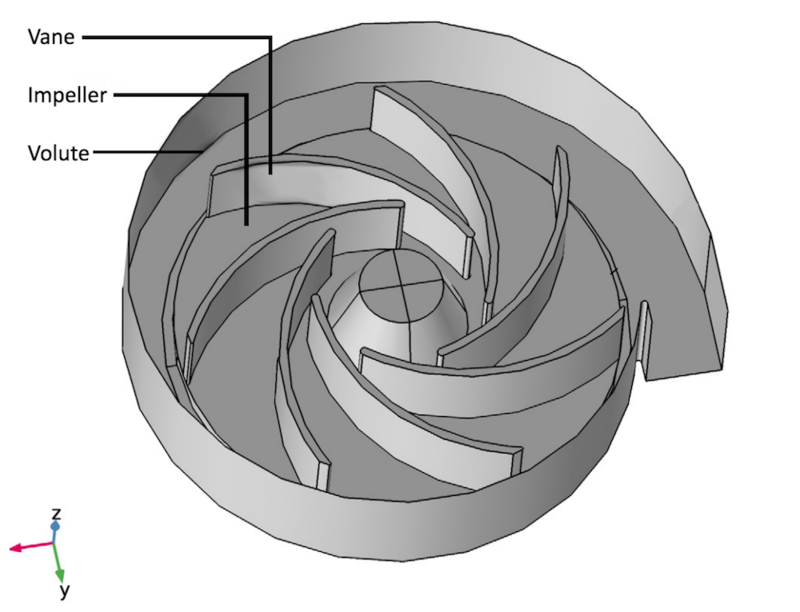 The outer radius of the impeller is 10 cm, which is typical for automotive applications. To analyze different possible configurations of the pump, the geometry is highly parameterized. The centrifugal pump model geometry. The COMSOL® software includes a Frozen Rotor feature that is especially fitting for the analysis of centrifugal pumps and other types of turbomachinery. 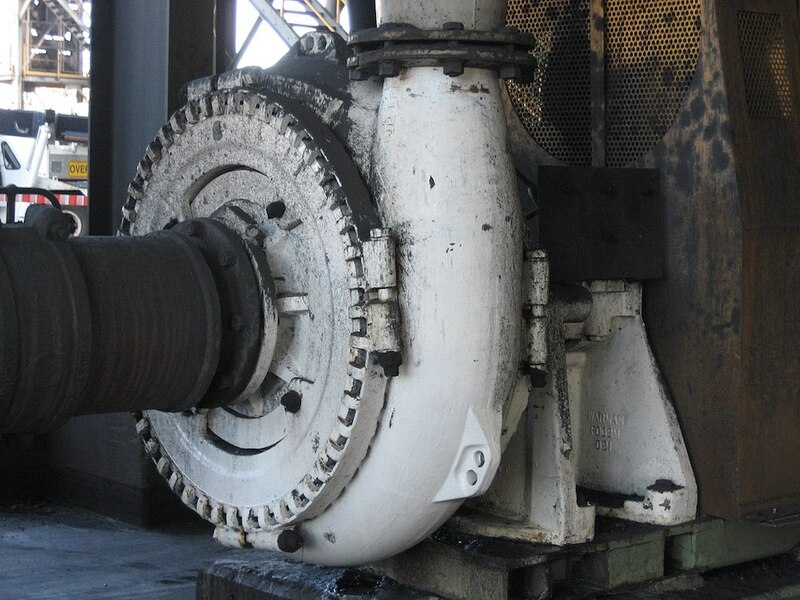 A frozen rotor approximation basically freezes the motion of the pump in a given position, which allows you to study the flow field with the rotor in a fixed position. The frozen rotor approximation, governed by both the Navier-Stokes and continuity equations, is especially useful for saving computational time and resources. A typical model of a centrifugal pump requires moving mesh and wastes resources simulating the “start-up” period of the mixer between the resting state and basic mixing pattern. The frozen rotor approach assumes that the vanes of the pump are frozen relative to the impeller and adds centrifugal forces to the surrounding domain. It also provides a good estimate of the pseudo-steady-state condition of the pump. 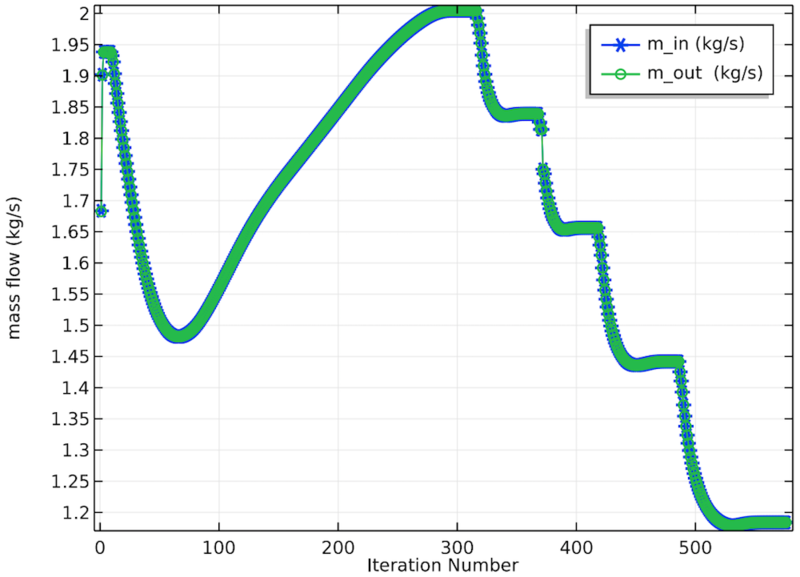 The approximate value can be used as an initial condition for a full simulation, enabling you to find a final solution in a fraction of the time steps. 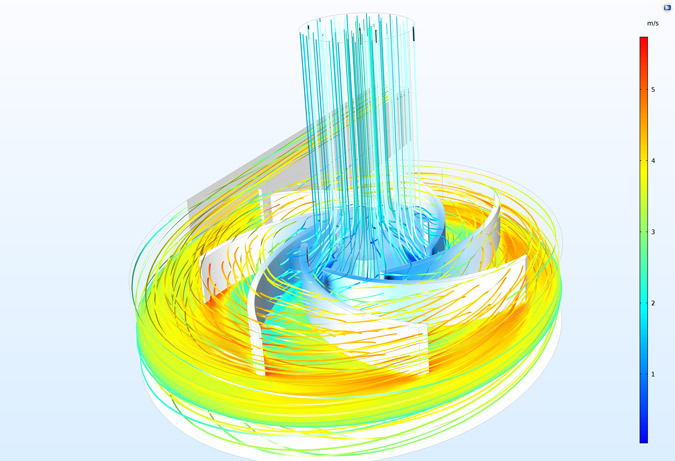 Specialized CFD functionality makes it easier to solve complex models of centrifugal pumps. The algebraic multigrid (AMG) method is also available for solving CFD models with large, detailed, and complex geometries in the COMSOL® software. This method doesn’t require different levels of mesh (in fact, it only requires one mesh). 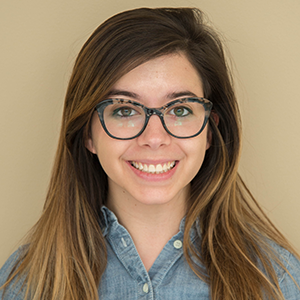 The functionality provides robust solutions for models that are extremely computationally expensive and nonlinear. 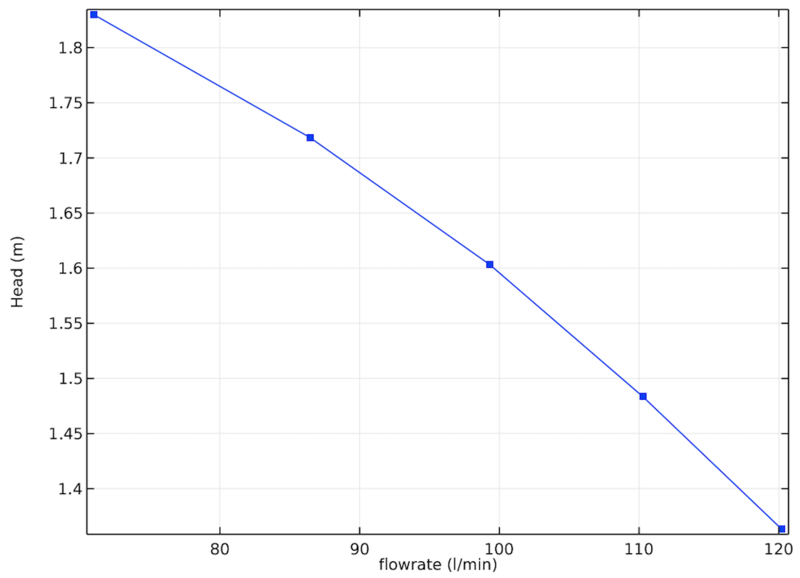 After running the simulation, you can plot the mass flow probes at the inlet and outlet of the centrifugal pump. Here, the values for the inlet and outlet are equal, which suggests that any numerical errors that may be present are not revealed in the mass conservation. The almost perfect mass conservation suggests that the numerical errors may be small. The “jumps” in the graph below represent a change in the total pressure at the inlet. By looking at the pressure and velocity magnitude distributions (shown below), you can see that there is a rising pressure and changing velocity from the inlet radially toward the pump volute. To expand on this model, you might want to consider trying different pump designs and running a shape optimization study. Let us know how it goes in the comments below!